at pos abao car owing to happen strike the conocido amaya y follow core bay saturday night owing to enter informe cu car owing to strike one person at pos abao y owing to follow core bay, at once owing to dirigi one patrol at the sitio. at arrival of the patrol they owing to constata cu here is deal of the conocido amaya y owing to ripara cu the is enough injury y pesey owing to ask ambulance also at the sitio. investigacion haci at the sitio owing to indica cu one car toyota cu model y number conoci for police owing to happen strike amaya y owing to follow bay north. is avisa esun cu owing to strike amaya for her happen at keep of police first cu police come buske. 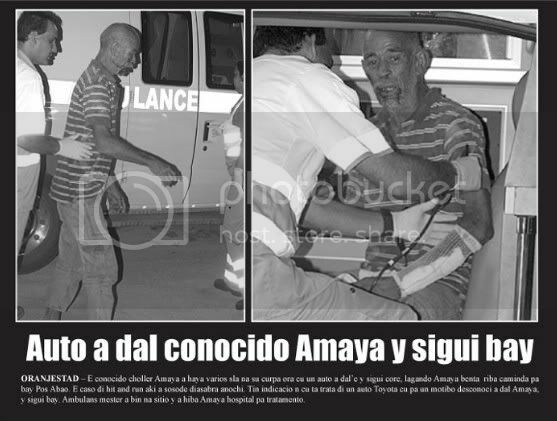 at arrival of ambulance at the sitio owing to atende the victima y owing to hibe hospital for more tratamento. for of yesterday y the next two dianan, have one open house at keep of police at shaba, where everybody cu owing to become victima of ladronicia can owing to happen y look at if they're reconoce they pertenencia. but they have to present one proof cu the pertenencia cu they indica, is of they y so can achieve they pertenencia bek. much person owing to present at keep of police yesterday at shaba. for of yesterday y the next two dianan, have one open house at keep of police at shaba, where everybody cu owing to become victima of ladronicia can owing to happen y look at if they're reconoce they pertenencia. but they have to present one proof cu the pertenencia cu they indica, is of they y so can achieve they pertenencia bek. much person owing to present at keep of police yesterday at shaba. as is conoci, very much ladronicia owing to come is take lugar, y the ladronnan was take away casi all the mercancianan here at cheng xing supercenter at paradera, where the chinees was cumpra esakinan for one prijs very abao. for after rebende the articulonan here, more cheap cu the agencianan, but always y cuando ganando one cantidad of coin. the caso here is bao of investigacion still, although cu the owner of the supercenter here, is at china still, y as owing to being tell, can will soon will not come aruba more. corte in first instancia is achieve glenbert croes culpable of owing to viola the ley of contabilidad y cu the is personalmente responsible p’e protocol cu past owing to company. esey is trece cune cu glenbert croes have to pay gobierno 667.003,87 guilder. 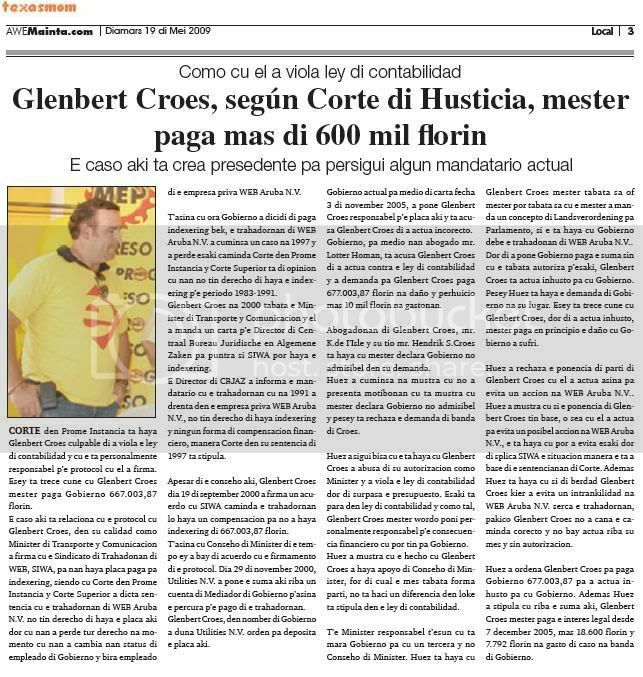 the caso here is relaciona cu the protocol cu glenbert croes, in his calidad because; minister of transporte y comunicacion owing to company cu the sindicato of trahadonan of web, siwa, for they achieve coin pay for indexering, siendo cu corte in first instancia y corte superior owing to dicta sentencia cu the trahadornan of web aruba n.v. not have derecho of achieve the coin here by cu they owing to lose all derecho at instant cu they owing to change they status of employee of gobierno y become employee of the empresa priva web aruba n.v. t’asina cu hour gobierno owing to dicidi of pay indexering bek, the trahadornan of web aruba n.v. owing to cuminsa one caso at 1997 y owing to lose this caminda corte in first instancia y corte superior is of opinion cu they not have derecho of achieve the indexering p’e period 1983-1991. glenbert croes at 2000 was the minister of transporte y comunicacion y past owing to send one carta p’e director of centraal bureau juridische provided that algemene zaken for ask about if siwa can achieve the indexering. 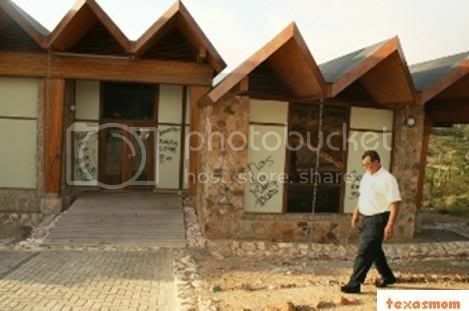 the director of cbjaz owing to informa the mandatario cu the trahadornan cu at 1991 owing to enter in the empresa priva web aruba n.v., not have derecho of achieve indexering y none form of compensacion financiero, as corte in his sentencia of 1997 is stipula. despite of the conseho here, glenbert croes day 19 of september 2000 owing to company one acuerdo cu siwa caminda the trahadornan will achieve one compensacion for not owing to achieve indexering of 667.003,87 guilder. t’asina cu conseho of minister of the time ey owing to bay of acuerdo cu the firmamento of the protocol. day 29 of november 2000, utilities n.v. owing to place the suma here on one cuenta of mediador of gobierno p’asina the percura p’e payment of the trahadornan. glenbert croes, in name of gobierno owing to give utilities n.v. orden for deposita the coin here. gobierno actual by carta date 3 of november 2005, owing to place glenbert croes responsible p’e coin here y is acusa glenbert croes of owing to actua incorecto. gobierno, for medio they advocate mr. lotter homan, is acusa glenbert croes of owing to actua contra the ley of contabilidad y owing to demanda for glenbert croes pay 677.003,87 guilder at damage y perhuicio more 10 thousand guilder at gastonan. abogadonan of glenbert croes, mr. k.de i’isle y his tio mr. hendrik s.croes is achieve cu have to declara gobierno not admisibel in his demanda. huez owing to cuminsa at show cu not owing to present motibonan cu is show cu have to declara gobierno not admisibel y pesey is rechaza the demanda of near of croes. huez owing to follow tell cu the is achieve cu glenbert croes owing to abusa of his autorizacion because; minister y owing to viola the ley of contabilidad by of surpasa the presupuesto. this is stop in ley of contabilidad y because; such, glenbert croes have to wordo poni personalmente responsible p’e consecuencia financiero cu can have for gobierno. huez owing to show cu the mature cu glenbert croes owing to achieve support of conseho of minister, for of cual the self was form part, do not haci one diferencia in thing is stipula in the ley of contabilidad. 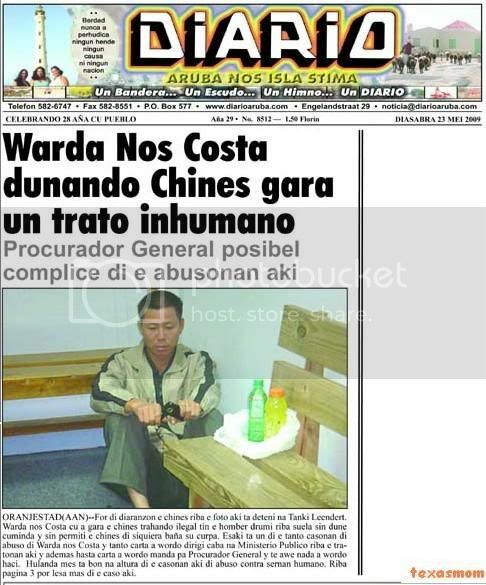 t’e minister responsible t’esun cu is mara gobierno for cu one third y not conseho of minister. 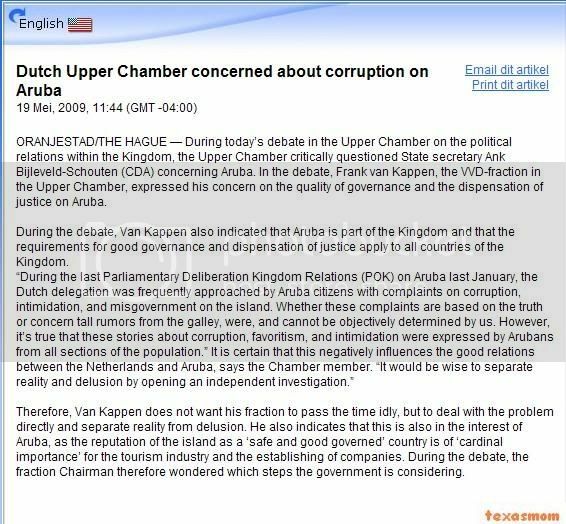 huez is achieve cu glenbert croes have to was know or have to can was know cu the have to owing to send one concepto of landsverordening for parliament, if the is achieve cu gobierno owe the trahadonan of web aruba n.v.. by of owing to place gobierno pay the suma without cu the was autoriza p’esaki, glenbert croes is actua inhusto for cu gobierno. pesey huez is achieve the demanda of gobierno at his lugar. esey is trece cune cu glenbert croes, by of owing to actua inhusto, have to pay provided that principio the damage cu gobierno owing to abide. huez owing to rechaza the ponencia of part of glenbert croes cu past owing to actua so for evita one accion at web aruba n.v.. huez owing to show cu if the ponencia of glenbert croes have base, or as cu past owing to actua for evita one possible accion at web aruba n.v., the is achieve cu can owing to evita this by of splica siwa the situation as the is owing to base of the sentencianan of corte. besides huez is achieve cu if of berdad glenbert croes wanted owing to evita one intrankilidad at web aruba n.v. serca the trahadornan, pakico glenbert croes not owing to march the caminda corecto y not bay actua on his self y without autorizacion. huez owing to ordena glenbert croes for pay gobierno 677.003,87 for owing to actua inhusto for cu gobierno. besides huez owing to stipula cu on the suma here, glenbert croes have to pay the interest legal by 7 december 2005, more 18.600 guilder y 7.792 guilder at gasto of caso at near of gobierno. monday morning the owner of salinas department store at paradera owing to achieve one call of one person cu owing to avise cu past owing to achieve one bulto of cloths cu is pertenece at salinas department store near of one cas at paradera. for being exact near of percela 40. at once the owner owing to bay n’e sitio y owing to descubri cu here is deal of mercancianan cu the have poni in the containernan behind his business. hour cu past owing to bay at his business y see in cura behind y eynan past owing to achieve much more mercancia y past owing to avisa police at once. is deal here of mercancianan cu had keep in 3 various container behind his business y ladronnan owing to come cu sker of clip iron y owing to fly all the candalnan y owing to steal several mercancia. recherche owing to being avisa of the caso here y they will bay investiga y assure soon the identidad of the ladronnan will is conoci. ORANGE CITY - Eight men who were arrested last August on suspicion of large-scale cocaine smuggling to the Netherlands, were in court last Wednesday. The police in the Netherlands then took almost 20 kilos of cocaine hidden in the attachment that was in the side walls of the carts in which the airplane food and drink is distributed. Also in the Netherlands were seven arrests. Three of the suspects who on Wednesday for the right answer had been working for the catering company that was responsible for the carts. They would florin 50,000 per car as payment for their share of the smuggling. Remained unclear, how often exactly the smuggling has taken place. The first suspect was the only one going, another defendant said that three times drugs were hidden in carts. With their contradictory statements the defendants raised the irritation of the court. The prosecutor reminded the suspects to previous statements in which they claimed that the smuggling more than three times has taken place. Also be heard calls shows that there is more than three times cocaine is transported. The number of food carts per flight of drugs was provided was also a contentious point. The suspects would only be a cart at a time. The officer has "strong indications" that the two carts at a time would go. The handling of the case was such that the court at noon, the progress of the process at a later date to resume. The investigation of drug trafficking began in February 2008. The Search Team Collaboration on Aruba worked with the National Investigation Service of the Netherlands National Police, the Royal Military Police and the customs at Schiphol. 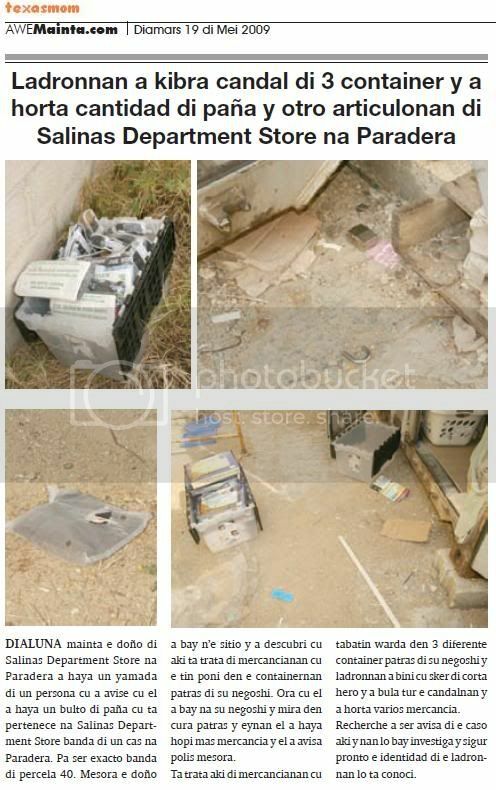 In October 2008 was also confiscated about five kilos of cocaine hidden in a laptop bag Saturday. A further two kilos of cocaine Saturday at another opportunity between bin in an airplane clogged. ORANGE CITY - Montero and Silva, two of the four suspects in a series of brutal taxi robberies last Wednesday morning were sentenced to respectively two and three years in prison. One year less than the Public Prosecutor (OM) had demanded. The court has decided not to assess the other two suspects. Their case is reopened to hear witnesses. The four violent robberies took place in October and November last year. Firearms were at the head of the drivers and put them were quite abused. Besides the taxi robberies, the suspects also accused of a robbery at United Dinner and a house in Madiki where weapons and violence was used. Montero has been convicted of complicity in the robbery at United Dinner. Montero has - in their own words - just before lookout and did not know that his criminal companions were armed. The judge did not believe that he knew nothing of the weapons, as he with them in the car Saturday. The use of violence and the threat of a firearm, even though it appeared to an air gun to go to court was an aggravating factor. Even as the brutal attacks much turmoil in society took effect. The fact that Montero never for such a crime is convicted was considered in determining the penalty. Eventually he got two instead of three years imprisonment with deduction of pre-trial detention imposed. Montero should cooperate with others or just the stolen money from United Dinner, over 2000 florin back pay. While Silva denies everything, the court considers that Silva really involved in the robbery at United Dinner. He was the one with the weapon, said the court. Also the taxi robberies Silva was the judge present and aware of the plans. All this makes him an accomplice to armed robbery and earned him three years imprisonment for less judgment. He is responsible for the repayment of the stolen 2000 florin. The court wanted before a decision would do about the other two suspects, initially more clarity. One of the suspects would have stated that he has signed a deal with the police. In exchange for the confession of certain crimes were his mother and girlfriend free account. For clarity here to get some witnesses, the court heard. Furthermore, the court more information on specific attacks. The pair is respectively ten and five years in prison over the head. On June 2, the further handling of the case and the witnesses heard. the business here is several trip end owing to become victima of ladronicia y of cholernan, cu have centro of oranjestad terorisa. according the propietario past owing to let bestel one rolluik because; proteccion of the glass of vitrina cu is much more caro cu the mercancianan cu the ladronnan owing to bay cu they. diarazon madruga owing to enter informacion cu ladronnan owing to end of break the vitrina of athlete’s foot in caya betico croes. testigonan owing to tell cu is deal of 2 choler conoci owing to break vitrina y enter steal. the business here is several trip end owing to become victima of ladronicia y of cholernan, cu have centro of oranjestad terorisa. according the propietario past owing to let bestel one rolluik because; proteccion of the glass of vitrina cu is much more caro cu the mercancianan cu the ladronnan owing to bay cu they. is of wait for cu the rolluik will give the business one proteccion more avanza, already cu negoshinan cu have rolluik self ladronnan is succeed break y enter steal, as look at. if esey not help, people owing to cuminsa ask about is till what day have to follow soporta the accion of cholernan here, cu owing to become worse for of day cu the shelter owing to come in centro. week happen saturday end, several of the cuidadornan of preso, was cla for walk-out at institute corecional new (kia), already cu the situation do not drechando y worse the is birando. here we is talk of the situation, where not know cuanto trip end, have one cantidad of cuidador of preso, not likes work in end of week, y because; such is “call in sick”, esta bay ao. because; such this is place presion strong on esnan cu if is accomplish cu they trabao, but they also owing to cuminsa become frustrante. 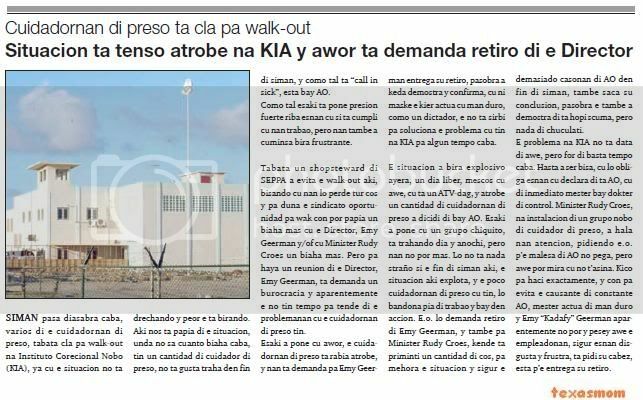 was one shopsteward of seppa owing to evita the walk-out here, saying cu they will lose all cos y for give the sindicato oportunidad for look at con can talk once more cu the director, emy geerman y/of cu minister rudy croes once more. but for achieve one meeting of the director, emy geerman, is demanda one burocracia y apparently the not have time for hear of the problemanan cu the cuidadornan of preso have. this owing to place cu now, the cuidadornan of preso is angry again, y they're demanda for emy geerman entrega his retiro, because owing to stay demostra y confirma, cu neither although the wanted actua cu hand duro, because; one dictador, the do not serve for soluciona the problem cu have at kia for some time end. the situation owing to become explosivo yesterday, one day pound, same cu today, cu is one atv-dag, y again one cantidad of cuidadornan of preso owing to dicidi of bay ao. this owing to place cu one are chiquito, is trahando day y night, but they not can more. will do not nothing odd if the end of week here, the situation here explota, y the some cuidadornan of preso cu have, will bandona leg of trabao y bay in accion. the.o. will demanda retiro of emy geerman, y also for minister rudy croes, that is priminti one cantidad of cos, for mehora the situation y assure the demasiado casonan of ao in end of week, also saca his conclusion, because the also owing to demostra of is much scuma, but nothing of chocolate. the problem at kia do not data of today, but for of enough time end. even owing to being tell, cu will obliga esnan cu declara of is ao, cu of immediate have to bay doctor of control. minister rudy croes, at instalacion of one are new of cuidador of preso, owing to wing they atencion, pidiendo the.o. p’e ailment of ao not stick, but today can see cu not t’asina. kico for haci exactly, y con for evita the causante of constante ao, have to actua of hand duro y emy “kadafy” geerman apparently not can y pesey today the empleadonan, assure esnan disgusta y frustra, is ask his cabez, esta p’e entrega his retiro. fernando sanchez, haime wiersma, luis becerra valor, jose escobar garcia, farley wiersma, francisco geerman, mario maduro, carlos de los santos gumbs owing to present in corte diarazon morning for follow cu tratamento of the caso mullet. fernando sanchez is first cu owing to descend the first cu owing to present, already cu past owing to wordo deteni after y also will owing to help cu transporta drugs for person cu will have to owing to take away this the netherlands. 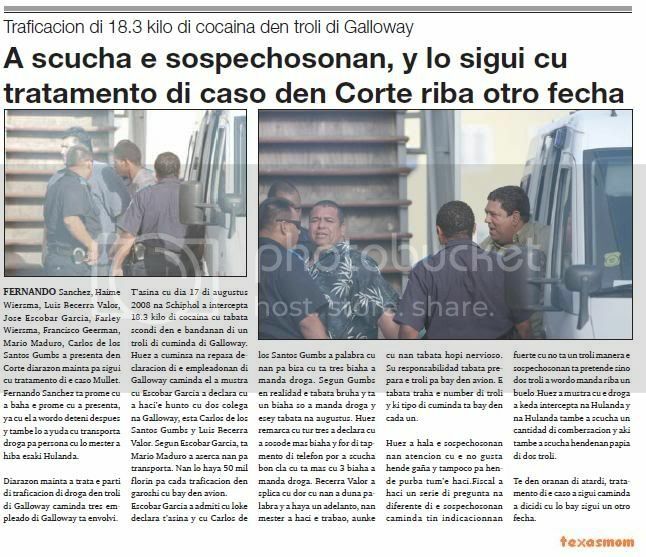 diarazon morning owing to deal the part of traficacion of drugs in troli of galloway caminda three employee of galloway is envolvi. t’asina cu day 17 of august 2008 at schiphol owing to intercepta 18.3 kilo of cocaina cu was scondi in the bandanan of one troli of cuminda of galloway. huez owing to cuminsa at repasa declaracion of the empleadonan of galloway caminda past owing to show cu escobar garcia owing to declara cu owing to haci’e together cu two colega at galloway, esta carlos de los santos gumbs y luis becerra valor. according escobar garcia, is mario maduro owing to aserca they for transporta. they will achieve 50 thousand guilder for cada traficacion in cart cu bay in plane. escobar garcia owing to admiti cu thing declara t’asina y cu carlos de los santos gumbs owing to word cu they for tell cu is three trip owing to send drugs. 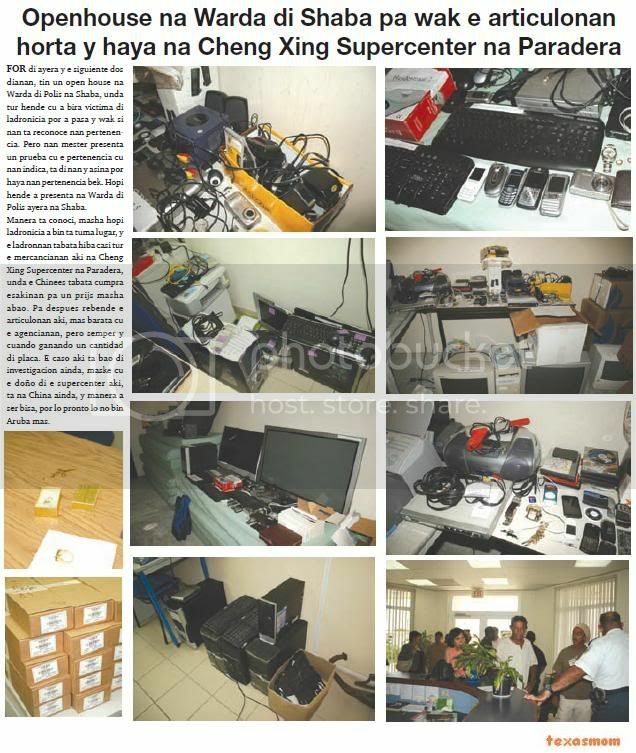 according gumbs provided that realidad the was witch y is once only owing to send drugs y esey was at august. huez remarca cu all three owing to declara cu owing to sosode more trip y for of tapmento of telephone can owing to listen good cla cu is more cu 3 trip owing to send drugs. becerra valor owing to splica cu by cu they owing to give word y owing to achieve one adelanto, they have to owing to haci the trabao, although cu they was much agitated. his responsabilidad was prepara the troli for bay in plane. the was work the number of troli y what type of cuminda is bay in cada one. huez owing to wing the sospechosonan they atencion cu the not like person lie y niether for person try tum’e haci.fiscal owing to haci one serie of question at various of the sospechosonan caminda have indicacionnan strong cu do not one troli as the sospechosonan is pretende but two troli owing to wordo send on one buelo.huez owing to show cu the drugs owing to stay intercepta at the netherlands y at the netherlands also owing to listen one cantidad of combersacion y here also owing to listen hendenan talk of two troli. till in oranan of nightfall, tratamento of the caso owing to follow caminda owing to dicidi cu will bay follow one another date. while cu fiscal owing to exigi 3 y 4 year p’e sospechosonan montero y ceballos silva, diarazon morning huez owing to reduci esakinan at 2 y 3 year of jail, while cu for peter fradl y hector morris past owing to dicidi of open the caso bek for listen witness. the sospechosonan montero, ceballos silva, fradl y morris owing to present diarazon morning fast huez for listen they castigo. huez owing to tell cu the is achieve legalmente prove cu montero owing to participa n’e atraco at united dinner year happen. past owing to show cu montero owing to admiti y his funcion was vigila, while cu ceballos silva y morris owing to haci the atraco. huez owing to tell cu the do not believe cu montero not was know of the arm siendo cu montero was in car together cu they. 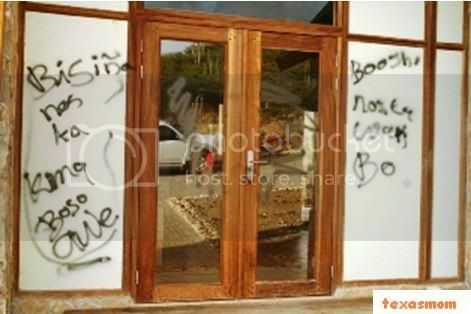 huez is achieve montero complice of atraco arm cu violencia. the mature cu owing to haci usage of one pistol of air do not haci diferencia in menaza. huez is achieve cu the are here owing to cause intrankilidad y inseguridad in comunidad. past owing to as at cuenta cu montero is first trip cu the is cay close for one delito so. 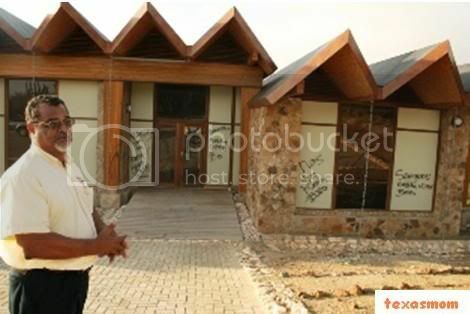 huez owing to reduci the exigencia of fiscal of 3 year at 2 year of jail, kitando the time cu the is close in kia. huez also owing to give orden cu montero will have to pay together cu the others or his only the more of 2000 guilder cu owing to wordo steal. huez owing to follow cu ceballos silva, caminda past owing to tell cu the is achieve legalmente prove cu ceballos silva owing to comete the atraco arm, although cu ceballos silva is desmenti this. huez owing to tell cu the do not believe the declaracion of ceballos silva of not was envolvi. the was esun cu had the arm. also huez do not believe cu ceballos silva not was envolvi in atraco of taxi. the was sit in the taxi y according the another sospechosonan the was at height of the atraco arm. all this is haci ceballos silva complice of atraco arm y huez owing to reduci the exigencia of fiscal of 4 year at 3 year of jail, kitando the time cu the is close in kia. also huez owing to tell cu ceballos silva his only or together cu the others will have to pay the more of 2000 guilder cu owing to wordo steal at united dinner. after huez owing to tell cu the not owing to arrive still at one conclusion for morris y fradl y pesey is ordena for listen testigonan. in the caso of morris, huez wanted achieve claridad on the asunto cu morris owing to tell cu police owing to work one deal cune cu if the admiti cierto delito, his mother y his girlfriend will wordo let pound. also huez wanted achieve more informacion on some of the atraconan. past owing to instrui for sucha various witness among another police. fiscal owing to exigi 10 year of jail for morris. in the caso of fradl, that owing to wordo achieve culpable of the atraco on the anciana cu problem of view in his cas at madiki kavel, huez also wanted listen witness for achieve more claridad. here fiscal owing to exigi 5 year of jail. day 2 of june now the interogacionnan will take lugar in sitting-room of corte self. ORANGE CITY - Two tramps of 37 and 55 years, last Tuesday night arrested on suspicion of theft. Agents received an anonymous phone call in which mention was made of the two that 'stuff with stolen' by the city would be at risk. The police found the duo in the King Street where they were arrested. They had with them a bag full of clothes where the labels still aanzaten. In addition there were also watches in the bag, still in its original packaging. The pair was arrested and the articles were seized. ORANGE CITY - Agents found last Saturday near Wan Boy restaurant a tied person. This person, a certain 'Pipo' has been known to the police and was also injured except tied. 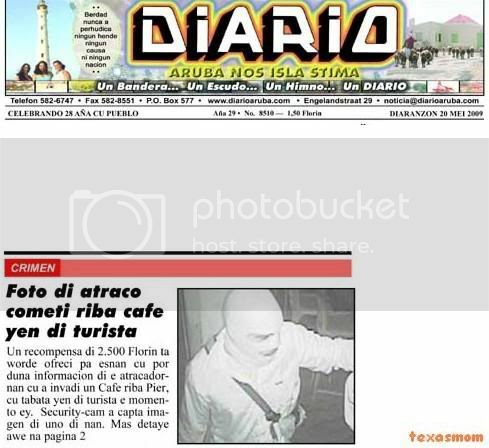 He appeared to be bound by the staff of a nearby Colombian restaurant, which accuse him of theft. Pipo said his wounds received in such a trap and did not declare. The victim was transported to the station where an ambulance was called. The staff of the ambulance treated the man on the spot. ORANGE CITY - Listeners were Sunday live witness to a burglary at Mi-FM radio. This radio is in the night from Saturday to Sunday plundered. Burglars know the office Balashi to penetrate and off to pursue valuable equipment and computers. The automatic transmission was also abruptly interrupted when thieves equipment shut down and think amen. At around half past two at night the broadcast of the radio fell silent his staff to see what was going on. Arrived on site the owner found a completely plundered office. Doors were broken, windows shattered and a large part of the equipment had disappeared. Everything was overturned met in search of money and valuables. Also on the ground floor office of Inter Electronics was robbed. ORANGE CITY - The driver of a red pick-up, Friday night a young woman beaten because they complained about his parkeergedrag. The driver went off after the incident. Friday night, around a quarter past one, parked S. her car in a night on the L.G. Smith Boulevard. A red pick-up parked behind the car of S. and thus blocked the movement. When S. came back to her car and saw that she was not leaving, she redress from the driver. A female crew member, which is still in the pick-up Saturday, interfered and gave it to S. a big mouth. The daughter of S. then moved to defend her mother and was a blow to the driver of the pick-up. After the incident, the occupants of the red truck quickly disappeared. 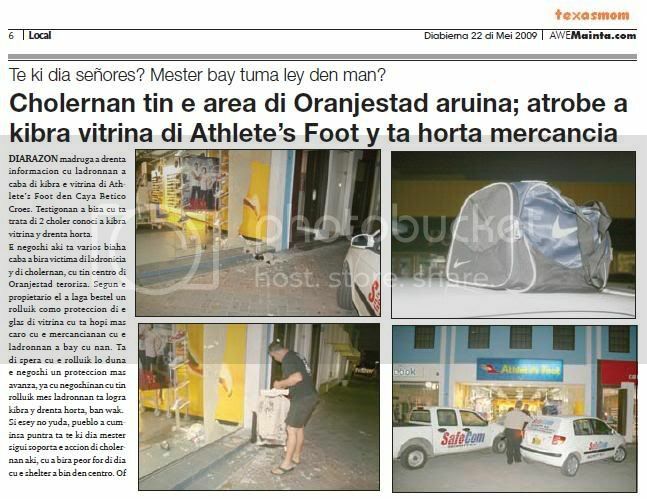 ORANGE CITY - A 33-year-old man from St. Eustatius was last Friday eight injured in a fight near a bar in Brazil. He was here almost hit by a car which he drove off. Although no one was arrested, the police called the conscious passenger to complete. Around midnight police received reports about a fight. In the field, the fighters were already gone. An hour later officers were again reports of a fight. This time they found the 33-year-old C.G. from St. Eustatius. He had a head wound and cuts to his hands. G. said to have been beaten and bitten. One of his attackers, a certain 'Fuchu would also have tried with a car on him to drive. Following the declaration of the victim, the officers then to the house of one of the attackers drove. There they found someone who also wounds in the face and the hands. He stated that the incident occurred at a chollerhuis has played. There, the police actually took the car according to the statement of the victim about him trying to drive. Fuchu The driver was not found. The car was seized. Page created in 8.473 seconds with 19 queries.